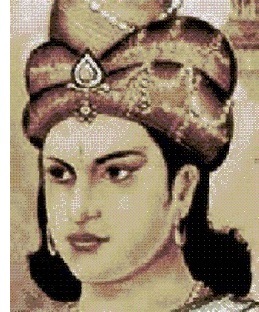 Ashoka the Great (304-232 B.C.) - Arguably India's greatest emperor, Ashoka was a true emperor in every sense of the word. The Mauryan Empire was one of the largest in India's history and stretched over nearly the entire subcontinent. He also had a long (ca. 273-232 B.C.) and by most accounts prosperous reign. Information about his life comes from a number of various works. There are Buddhist texts, known as the Avadanas, dating from the second century A.D. which record events in the lives of various well-known Buddhists. The two that deal with the Mauryan king are the Ashokavadana ("Narrative of Ashoka") and the Divyavadana ("Divine Narrative"). In addition, there are two Sri Lankan sources which mention him, the Dipavamsa and Mahavamsa. Finally, Ashoka left behind a record of his own, the Edicts of Ashoka. They are not single set of rulings, such as the Code of Hammurabi, but are engraved on pillars, and in some cases boulders and cave walls, and dispersed throughout India, modern-day Pakistan, Bangladesh and even Nepal. A total of 33 have been found (who knows if there are more). Many of these edicts contain references to Ashoka's Buddhist faith and have been considered as instrumental in spreading Buddhism as Buddha himself. Before converting, Ashoka was known to be ruthless and violent, as evidenced by the Kalinga War (see Kalinga War). He also rose to power by such means. His father had several wives and he himself had several older siblings and half-siblings, making it unlikely that he would ever inherit the throne. But upon his father's death, a war of succession broke out and he survived, killing several of his brothers along the way. As emperor he was even more cruel, executing ministers whose counsel he did not agree with and mistresses who displeased him. Even more twisted was the construction of an elaborate torture chamber, known as "Ashoka's hell." It was said to be a beautiful building on the outside, pleasing to the eye; but on the inside filled with any number of devices which would torture, maim or even kill those who entered. Had it not been for his Buddhist conversion, he likely would have gone down in history as Ashoka "the Fierce". Whether or not these stories are all true will never be known. They are described in the Buddhist texts and many historians believe they are exaggerations to demonstrate the transformation he underwent. However, it is true that his 13th edict records the great remorse he felt for those who died at Kalinga. And fortunately his conversion came relatively early in his reign, so hopefully his cruel acts ended at that time.